Rather than a cheap hotel with small rooms, it’s much better to think of Oak Hotel as an upscale backpackers’ hostel with private rooms for rugged compact urban living, which is how they position themselves. 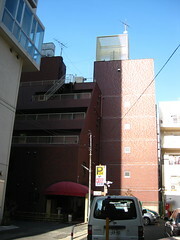 Oak Hotel’s terraced brick building is nestled into an alleyway in Taito City, just ten minutes’ leisurely walk down the left side of Asakusa-dori from Ueno Station and Keisei Ueno (or just a few steps from Inaricho Metro station on the Ginza line). I really wanted to like Oak Hotel. 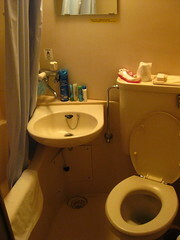 I loved the novelty of the tiny rooms and the even tinier bathrooms where you had to hunch to avoid bumping your head against the low ceiling in the shower. I loved the TV with just Japanese broadcast channels and their whimsical variety shows and shrill anime and samurai dramas. I loved the close proximity to the Metro and Ueno Park and Ameyokocho and Asakusa and Akihabara, with our pick of dozens of konbini and eating places right nearby. I loved how, when we checked-in, they asked me if I had a laptop, and when I said yes, they immediately gave me a bag with a cable modem and router in it (complete with amusingly translated Engrish manual) so I could plug into fast broadband internet right from our room. I loved that the staff were polite, friendly, accommodating, and fluent in English. And if we had stayed longer, I would have loved the downstairs informal common areas where you could eat and mingle with other visiting guests. I loved all that, but the room itself was so dusty that it was unlivable. As soon as we walked in we began coughing, and it only got worse when we turned on the heat and ventilation. We couldn’t even sleep from coughing, though we found some relief when we reversed position so our feet faced the headboard, and opened the windows to let in some clean — but freezing — air. A quick tissue-wipe of the headboard came up worryingly dirty, and items left on the desk for the day accumulated noticeable quantities of particulate matter. I don’t know if it was ambient dust in the building or air pollution (not likely since the outside city air coming in through the window was actually cleaner) or some other factor, but the allergens in the air were so thick that we tried to stay out of the room as much as possible, because almost every moment in the room was spent in a miserable state of what felt like mild but constant anaphasic shock. We breathed fine as long as we were outside. This meant we didn’t get to sleep much — a situation not helped by the sounds of coughing from other guests in the building. (I didn’t mind the thin walls, as these were to be expected, but they did broadcast to us the aural evidence that we were not alone in our bronchial woes.) 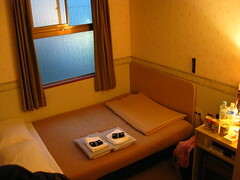 I really don’t get it because the room was well-kept and cleaned everyday, but the dust in the air remained intolerable. So yeah, great location, outstanding service, friendly staff, cheap price, free fast internet, but if you have allergic reactions to lots of dust, maybe don’t stay here, or at least don’t stay in Room 214.